Following the resounding success of ‘Marco Polo,’ Doctor Who returns to the historical genre with ‘The Aztecs,’ a story that not only survives in the video archives but is also definitively worthy of classic status. Once more there is no alien nor technological menace, different cultures and viewpoints providing all of the drama necessary. The four-part nature of the story keeps events moving at a brisk pace, but all of the subplots are given ample time to breathe. 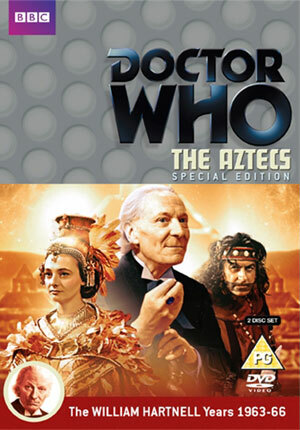 Notably, ‘The Aztecs’ is the first story to bring up the question of the TARDIS crew potentially changing history, the history teacher Barbara believing that she may be able to steer the Aztec culture away from its more barbaric tendencies and therefore avert its extermination at the hands of the Spanish. This understandably creates the core of the episode, and Jacqueline Hill ably proves that she is able to fully carry a story when thrust into the spotlight. Her scenes with William Hartnell are mesmerizing, and he hints at his own history as well as his own desires as he agonizingly explains that not one line of history can be rewritten. This is, of course, an internal drama of the Doctor’s that continues into the present series as well, but the script deftly handles its introduction here. Even with Barbara pretending to be a great god reincarnated, her successful halting of a human sacrifice ceremony only causes the distressed would-be victim to throw himself off a ledge to his death. Of particular interest in these early episodes is how cautious and hesitant the Doctor is to interfere with the affairs of others. The First Doctor seems uncannily at ease with the prospect of accepting human sacrifices, and this is only the latest in a series of questionable events that he chooses to overlook, but it’s fascinating to see his initial thought processes compared to the later regenerations’ as time takes its toll on him. The Aztec culture is not idyllic- full of lies, murder, and tricks- and this is expertly encapsulated by John Ringham’s Tlotoxl. The powerful message behind it all, though, is that this is purely human nature, something present in every culture on Earth to a varying extent. While the Doctor chooses not to join Barbara in her desire to change a culture, he does at least console her by suggesting that she was able to save at least one man, a small victory in the grand scheme of things but a victory nonetheless. This is possibly William Hartnell’s strongest performance yet, brilliantly showcasing his versatility as an actor as he easily jumps between a romantic subplot, takes a more heroic lead, and even takes part in a bit of comedy. Without ever feeling rushed or superfluous, Ian and Susan are both given engaging stories of their own as well, both highlighting how dangerous the culture is. With the guest cast on top form and some superb production work and set design that brings the period to life wonderfully, ‘The Aztecs’ hits top marks in every category. The pure historical is sadly a genre for the television series that has gone by the wayside as time has progressed, but ‘The Aztecs’ proves how incredibly engaging and exciting this type of story can be even without an alien or science fiction element.